In your letter to CCAL, dated 31 July 2008, you requested that CCAL submit a formal response to this consultation in September. Government maps, recently published by CCAL, highlight yet again, that road transport is the biggest single cause of all breaches of air quality laws across London. The solutions needed involve two overlapping ‘circles’ of measures – one for congestion (since vehicles are about half as polluting once they reach speeds of 30 kilometres per hour) and the other for emissions (such as low emission zones) – that target the most polluting vehicles in the most polluted areas. CCAL urges the Mayor of London (the Mayor) to keep the CCWE primarily on the grounds that traffic levels would rise significantly without it, leading to increased pollutants from vehicles. In CCAL’s view, it would be foolish of the Mayor to remove the CCWE when he would then need to toughen further additional measures, such as one or more additional inner low emission zones, that are already long overdue to reduce sharply hazardous vehicle emissions to comply with air quality laws in the same area of London. CCAL urges the Mayor to pursue vigorously stronger measures to reduce congestion across London. Instead of weakening (or removing the CCWE), the Mayor should build on the current ‘blunt instrument’ by offering dynamic (or ‘intelligent’) road pricing, such as ‘tag and beacon’ or better, in parallel with the current CCWE and Congestion Charge Central (CCC). This would give people the choice of paying a fixed congestion charge or opting to pay a flexible charge i.e. such that they might pay nothing to drive short distances outside the hours of congestion. In due course, once dynamic road pricing is shown to work well, it should take over fully from the current ‘blunt’ scheme and be extended to operate, where necessary, across London. CCAL is concerned that a relatively small number of vehicle owners, who are primarily responsible for congestion, are – at little or no cost to themselves – having a disproportionate, negative impact on the health of hundreds of thousands of Londoners. Those causing congestion should pay the full environmental cost of their actions as part of a much wider ‘polluter pays’ strategy in London. CCAL supports measures to reduce congestion, in their own right, as a means of increasing road capacity and improving quality of life for the vast majority of Londoners. Last but most importantly, CCAL emphasises the need for the Mayor to work closely with the government to implement measures urgently to ensure that air quality laws are fully complied with throughout London not just in the CCWE area. The government has admitted that road transport is the cause of all the breaches of air quality laws in the United Kingdom (UK) with diesel emissions being by far the biggest single component. The solutions needed involve two overlapping ‘circles’ of measures – one for congestion and the other for emissions – that target the most polluting vehicles in the most polluted areas with technology-based solutions and create a ‘tipping point’ of behavioural change backed by awareness, persuasion, incentives and regulation (when necessary). Behavioural change offers the most cost effective solutions. In CCAL’s view, measures to reduce congestion are needed also to tackle the most polluted areas of London since hazardous emissions fall sharply as vehicles move faster. Department for Transport (DfT) data shows that most vehicles emit about half the carbon dioxide (CO2) and hazardous emissions once they reach speeds of 30 kilometres per hour. Vehicles causing congestion are therefore some of the biggest polluters. CCAL supports measures to reduce congestion, in their own right, as a means of increasing road capacity and improving quality of life for the vast majority of Londoners. i. The Mayor has a duty to ‘work towards’ the Limit Values: The Mayor of London has a statutory duty to ‘work towards’ the Limit Values for particulate matter (PM10) and nitrogen dioxide (NO2). The Supplementary Information document for the CCWE consultation states on page 27 that the impacts on the CCWE area of returning traffic in 2010 ‘are estimated [at] around 5 per cent more NOx [oxides of nitrogen], 7 percent more PM10 and 8 percent more CO2 [carbon dioxide] ’. In CCAL’s view, the Mayor would breach this statutory duty if he removed the CCWE without fully offsetting measures being in full operation. ii. The UK has a duty to achieve the Limit Values by deadlines: The UK has breached air quality laws in London for PM10 in each of 2005, 2006 and 2007. The government plans to apply for a time extension until 2011 to meet these obligations, as it is allowed to do under the EU directive on ambient air quality and cleaner air for Europe (the AQ Directive), which entered into force on 11 June 2008. To obtain such a time extension and avoid imminent legal action, the UK would need, amongst other things, to produce credible plans showing how it would eliminate all breaches of Limit Values for PM10 by 2011. If a time extension for PM10 is allowed by the European Commission (EC), Article 22 of the AQ Directive states that the UK must ensure that the Limit Value plus Margin of Tolerance is not exceeded in any circumstances i.e. average annual PM10 levels must never exceed 48 micrograms per cubic metre (μg/m3). Daily average exceedances are also limited. The government maps obtained by CCAL show that Brompton Road and Knightsbridge in the CCWE area are currently still expected to be in breach of air quality laws for PM10 in 2011. In CCAL’s view, measures to reduce congestion (such as the CCWE) and emissions are both needed to eliminate these breaches of air quality laws. In CCAL’s view, the Mayor would show disregard for air quality laws if the removal of the CCWE is pursued when neither he nor the government have yet shown how air quality laws for PM10 (or NO2) will be complied with in the CCWE area and throughout London. CCAL wrote to the EC on 5 May 2008 on this subject copying you. iii. The UK has a duty to maintain air quality once the Limit Values are met: The UK has an obligation under Council Directive 1999/30/EC/Article 1 to ‘maintain ambient air quality where it is good and improve it in other cases with respect to sulphur dioxide, nitrogen dioxide and oxides of nitrogen, particular matter and lead’. This obligation has been transposed into UK law in the Air Quality Limit Values Regulations 2003 in Regulation 15, paragraph 2 (see page 8). By referring in the latter to ‘zones’ the government may not have been transposed correctly – with that mistake alone, perhaps exposing the UK to infringement action by the EC. This directive is repealed by the new AQ Directive with effect from 11 June 2010. The excellent London Air Quality Network website shows that average annual PM10 in Cromwell Road fell from just on the Limit Value in 2006 (i.e. 40 μg/m3) to 35 μg/m3 in 2007 (and 34 μg/m3 so far in 2008). 2007 included nearly 11 months of the CCWE in operation. The number of days exceeding 50 μg/m3 fell from 60 to 26 in the same period (with the Limit Value for exceedances being 50) i.e. that section of Cromwell Road moved from non-compliance to compliance for PM10 in 2007. In CCAL’s view, the government has a clear statutory duty (and obligation as a Member State) inter alia to ensure that PM10 air pollution does not rise again above the Limit Values in the CCWE where it has fallen below these levels – as it surely would if road pricing was removed from that area (unless simultaneously other measures were put in place to mitigate fully its removal). CCAL is therefore forwarding this letter to the government and urging it to comply fully with these obligations, if necessary forcing the Mayor to keep the CCWE. iv. The UK has a duty to ensure that the Limit Values plus a Margin of Tolerance are not exceeded if the time extension provisions are used: The UK is required to comply with Limit Values for NO2 by January 2010. Under the new AQ Directive, the UK may apply for a time extension to comply with these Limit Values until January 2015. Similar provisions apply for NO2 as apply for PM10, not least under Article 22, such that if the UK is granted a time extension it must ensure that the Limit Value plus a Margin of Tolerance is not exceeded in any circumstances i.e. average annual NO2 levels must never exceed 60 μg/m3. Hourly average exceedances are also limited. Average annual NO2 levels far exceed 60 μg/m3 in parts of the CCWE e.g. Brompton Road, Knightsbridge and Kings Road. Maps in the City of Westminster’s current consultation on its air quality strategy highlight the seriousness of this problem across central London into 2010 and beyond. If no time extensions are granted, the Limit Values must be complied with by the times already specified in legislation. In CCAL’s view, congestion and emission measures are both needed if the UK is to reduce air pollution near London’s busiest roads by more than one-third by January 2010 as required by air quality laws. Please consider this letter as a formal reminder to you, as Mayor of London, of these issues. CCAL supports keeping the CCWE so that it, and the CCC area, can play a valuable part in improving – and not making worse – air quality in London. If you as Mayor decide to remove or weaken the CCWE, it is plain – all other things being equal – that you will need to tighten commensurately and concurrently the additional inner LEZ(s) that must be operating in London by early 2010. To over-simplify it: ‘let 33,000 vehicle owners choose not to pay £8 to enter the CCWE; or ban an extra 33,000 vehicles each day from the additional inner LEZ(s)’. 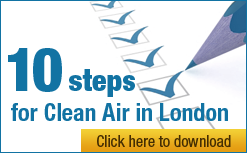 CCAL urges the Mayor to strengthen the CCWE (and the CCC); CCAL set out measures to improve the CCWE and air quality in general in London in its letter to you dated 13 July 2008 (which is attached and included as part of this submission). In respect of the current, narrow, consultation questions, CCAL notes that those opting for any of the Option 3 alternatives are also implicitly supporting Option 1. CCAL considers that the Mayor should have included a fourth option with measures that would ‘strengthen’ the CCWE e.g. operating it seven days per week and the CCC and CCWE as two co-ordinated, independent schemes. As currently constructed, the consultation is biased towards removal of the CCWE. CCAL urges the Mayor to keep the CCWE and embrace road pricing, where necessary, across London. Congestion charging should be a meaningful part of the package of measures needed to comply fully with air quality laws. CCAL urges the Mayor not to remove the CCWE since to do so will make it necessary for him, all other things being equal, to introduce concurrently stronger measures to improve air quality than will otherwise be necessary. CCAL does not object to small administrative changes to the CCWE or the CCC, such as on payment terms, provided that the impact of these on emissions is fully and concurrently offset by commensurately stronger terms as part of one or more additional inner LEZs. CCAL objects to the Mayor’s proposal to introduce a charge-free period in the CCWE with the effect that ‘traffic and congestion levels could increase significantly during the free period’. CCAL does not object to small administrative changes to the CCWE or the CC, such as on payment terms, provided that the impact of these on emissions is fully and concurrently offset by commensurately stronger terms as part of one or more additional inner LEZs. CCAL would be pleased to meet you or your advisers to discuss these proposals as you proposed in your letter dated 31 July 2008.